San Francisco 49ers' quarterback Colin Kaepernick passes during NFL football training camp on Wednesday, Aug. 10, 2016. The quarterback at the center of a firestorm because he says he will sit on the bench during the national anthem to stand up for the rights of people of color, has sparked a new discussion — this time over his socks. 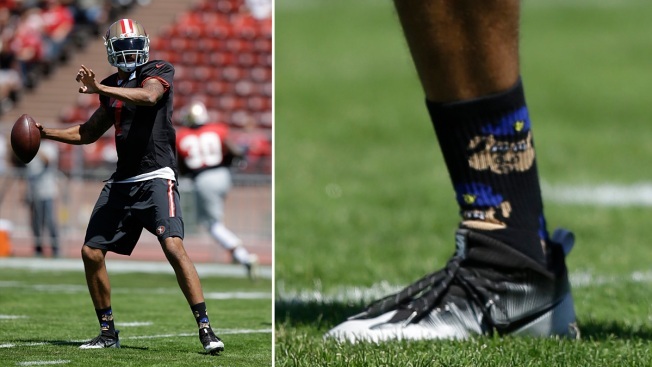 Photos of San Francisco 49ers QB Colin Kaepernick at an Aug. 10 training session at Kezar Stadium and other practices are now surfacing, showing him wearing black socks with pigs wearing police hats — an obvious dig at police officers. "I wore these socks, in the past," Kaepernick wrote on Instagram Thursday, "because the rogue cops that are allowed to hold positions in police departments, not only put the community in danger, but also put the cops that have the right intentions in danger by creating an environment of tension and mistrust. I have two uncles and friends who are police officers and work to protect and serve ALL people. So before the socks, which were worn before I took my public stance, are used to distract from the real issues, I wanted to address this immediately." In the 16th century, the term pig was derogatory for all people, and then years later, became a popular and unflattering nickname for police officers, according to the Dictionary of Bucking Slang, University Wit and Pickpocket Eloquence published in 1811. For its part, the San Francisco police officers union has demanded an apology from Kaepernick for not standing during the national anthem. President Martin Halloran invited Kaepernick to a training academy to see what a police officer's daily life is like. There was no immediate comment from the union on the socks. But the tweets and the digs flew as far away as Vermont, where the Burlington Police Department tweeted: "Wearing 'pig socks' cannot be compared to protesting oppression in broad, powerful messages like Ali, Smith & Carlos. Inspiring vs. crass." The socks saga followedwhat Kaepernick told reporters in the locker room on Sunday, when he talked about his disdain for the practices of many in law enforcement, reported CSN Bay Area. “There is police brutality,” Kaepernick said. “People of color have been targeted by police. So that’s a large part of it and they’re government officials. They are put in place by the government. So that’s something that this country has to change. Amid the criticism over his protest, many veterans this week used the Twitter hashtag #VeteransforKaepernick, saying that they are behind the player's right to express himself. Kaepernick has said that he has "great respect for the men and women who have fought for this country" and his protest is not anti-military. A test of how football fans will respond could come Thursday night. Kaepernick is set to be in San Diego when the 49ers play the Chargers in an annual Salute to the Military game. The idea behind the salute is to pay "tribute to the hundreds of thousands of current and retired military personnel who live and work in San Diego," the Chargers said in a news release this week. In San Diego, the national anthem will be performed by Petty Officer 1st Class Steven Powell from the U.S. Navy while 240 sailors, marines and soldiers present a U.S. Super Flag and service emblems from all branches of service. Color guards from the Navy, Marine Corps and Army will present the flag, the Chargers said. Wearing "pig socks" cannot be compared to protesting oppression in broad, powerful messages like Ali, Smith & Carlos. Inspiring vs. crass.